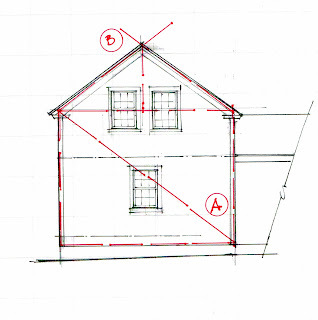 I have just finished writing about the Arnold House: how it uses the 3-4-5 triangle as a regulating principal and how it is almost but is not the same as the Golden Section. If you don't know what that is, please read the posts on the Arnold House. Thank you. I said the same thing about this house: it 'almost used Circle Geometry', but didn't. I realized I needed to look again. I do love the grace of the Golden Section and Circle Geometry. But look at how the 3-4-5 triangle fits. (A) marks the diagonal of the rectangle created by the 3-4-5 triangle. It's half the house. The other side matches it. 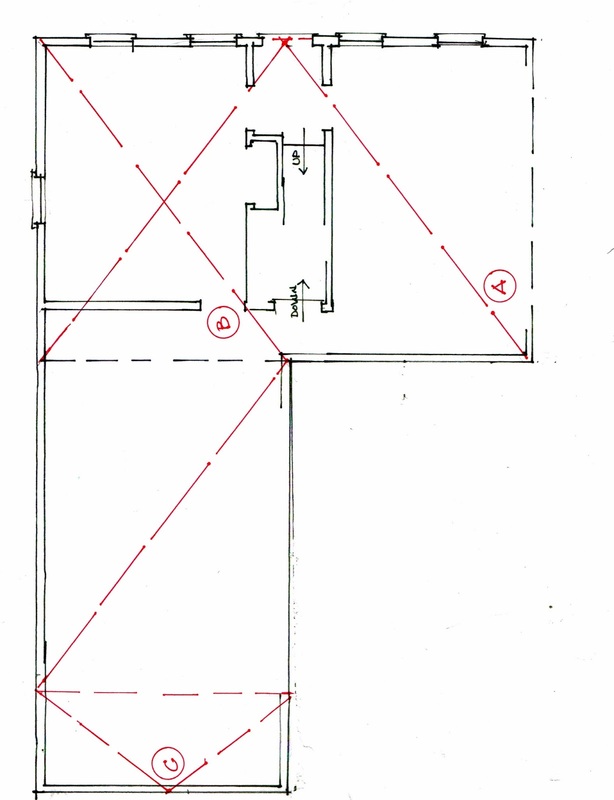 (B) marks the corner of the smaller room on the right, its size determined by the triangle. The larger rectangle forms half of the house footprint. 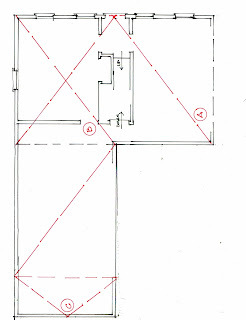 The room's proportions are determined by the proportions of the house itself. The back wing, a rectangle that matches the 2 front sections, is a little longer. (C) shows how the extra space is determined by half a 3-4-5 rectangle. I rather hoped the end elevation wouldn't fit the pattern! (A) shows the rectangle created by 2 3-4-5 triangles. It fits the size of the house, easily giving the master carpenter the dimensions he needed for post and beams. It even determines the roof pitch! Not a 9/12 or a 10/12 pitch, ratios commonly used today, but the 3-4-5 triangle. However, the floor heights, the window placement, the elevations still seem determined by both circle geometry and the Golden Section. The house's outline - its footprint, height and roof pitch - do seem governed by the triangle. How nice it would be if I could teleport back to 1840, watch the house-wright at work, and ask questions! My great thanks to Jay Cougar White Cloud for his good questions that pushed me to consider the simplicity of framing with the 3-4-5 triangle. Loved reading along, Great stuff here! Very busy, but we will catch up soon. I thought you would enjoy exploring the application of the 3-4-5. When the Amish Barnwrights sat me down and put me through the passes with it, they also had a "pentagram" in their materials, and said that most of Gods creation was based on that geometry. Funning how modern man often equates anything to do with a pentagram as being something else, while for the Old Order Amish it was not only a symbol of protection, it was a big part of "working knowledge" passed down through the generations. I think you would really enjoy exploring Pentagram geometry. What you will discover inside it is several remarkable proportions. Of course the "Golden Section" is right in the heart of it, but so too is the 3-4-5, and the square. I tell my students that exploring pentagram geometry will reveal ALL the foundational elements of ages great architecture, as well as nature itself. I believe in designing with the pentagram, in so doing the 3-4-5 and golden section both are there to support it; visually engendering homeostasis. thanks Jay. As usual good stuff to think about. I am always glad to see you have posted and added to the conversation - to our considering. I can't seem to modify my comment. I have never seen a 'shepherds stove' in the area where this house is. We seem to have moved from Rumford fireplaces to Franklin stoves and urban cast iron stoves. It may be because the area was seriously depressed after the War of 1812 and the subsequent Embargoes, and then the Panic of 1837. Shipping died and we didn't begin to prosper again until the mills came in the mid-1840's. The energy and inventions happening around the Hudson River and NYC had little impact here. Now that I am in western New England I see lots of design I simply had never heard of. 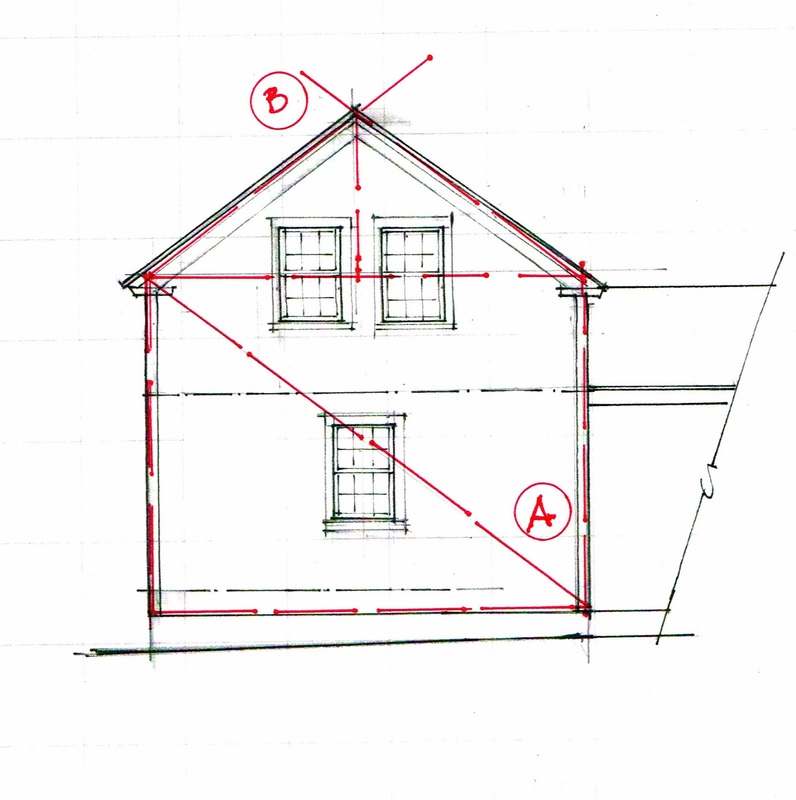 what do you want to know about a 10/12 roof pitch? I have found that houses governed by geometry as this one is, do not use numbers for the pitch, but as I show in this case the pitch that comes from the 3-4-5 triangle.